These assemblies are the same as our A1395-15, but these have the premium Universal Hose Ends with machined barbs for added coupling integrity. However they have the same working pressure as all other generic Universals. Detail Comments: Gorilla Hose Performance Warranty: Simply let us know you have a multi-purpose hose test application in which you want to try Goodyear Gorilla. Give us some details about your application, what brand and type of hose you're currently using and the average service life you've been getting. 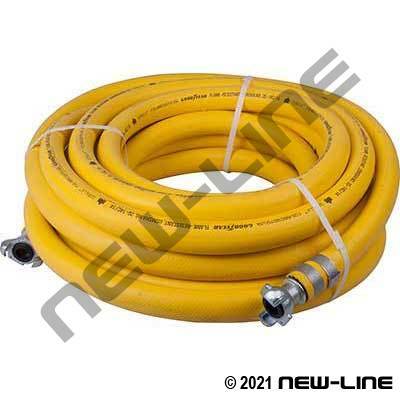 We will then provide you the test length of Gorilla hose and invoice you at your regular selling price. Goodyear Gorilla is guaranteed to outlast the multi-purpose hose it replaced, or Goodyear will give you back double what you were invoiced! No catch. No strings. Simple as that! Contact our customer service team for further details.